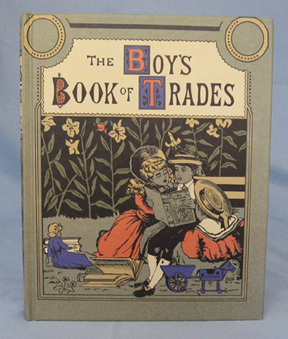 Although the cover is probably from a later addition, the discussion of the trades in the text applies to the 1860's. Some of the techniques were practiced for decades before the civil war period. While not every individual of the time period would have known about every trade, it would be reasonable to expect someone from the 1860's to know about some of them. Residents of small towns would most likely know about the almost universal trades of blacksmith and farrier. If water power was available, they would probably be familiar with the miller, although the use of steam engines reduced reliance on water power. Moderate size towns would have tanners, carpenters, painters, bakers, and a myriad of other trades. Large cities might have almost all the ones discussed in the book. For individuals involved in living history, this book would be a valuable reference for elements of everyday life in the community you portray. Soldiers would be expected to know at least a modicum of information about trades in their home communities. Every reader who hasn't examined the technology of the mid-nineteenth century will probably be amazed at the degree of specialization of their tools and the amount of mechanization already in practice. Our ordinary image is that their technology was relatively crude but, in reality, their mechanical devices were often of high precision.